The Charisma Chronicles: BAD Macy's, BAD! Well, who here knew Macy's was a bunch of bigots? Or worse yet, spineless bigots? 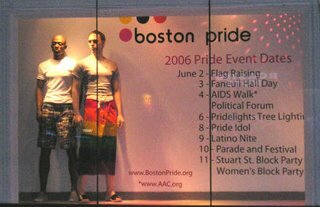 Yellow-bellied Macy's (Boston) has pulled it's PRIDE 06 window display because of pressure from a fanatical anti-gay group opposing it. How offensive is this window? It's NOT! 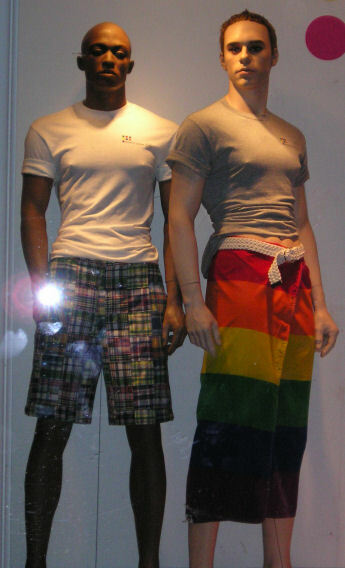 Well, other than the manequin wearing a pride flag as a sarong. But then again it's pride - why not? Shame on Macy's, shame on any gay Macy's employee who is allowing this. And shame on anyone who spends money at their establishment.